ADM Recovery Challenge medal design winner! The Summit County ADM Board announced the winning medal design at Community Support Service's Art of Recovery event last week. The design will serve as the theme of the Board's upcoming 2019 Recovery Challenge 5K. John Zarski, resident supervisor and client educator at IBH Addiction Recovery Center created the winning design. Mr. Zarski has been in long-term recovery for 4 ½ years. John’s thoughtful design was inspired by his knowledge and experience of the 12 Steps and shows that recovery happens when you “step up to the challenge”. He wants others to know that the steps seem simple, but are not necessarily easy. The medal will be given out to runners that complete the ADM Recovery Challenge 5K course around IBH Addiction Recovery Center’s scenic grounds in southern Summit County. This year’s race will be held on Saturday, June 1st and includes running/walking and obstacles that are metaphoric to the challenging path recovery can be for those fighting addiction and mental illness. The race also will offer a family-friendly one mile loop this year. Proceeds will benefit the Summit County ADM Support Committee, Inc., in its future educational and levy campaign activities on behalf of the County of Summit ADM Board. On-line registration is open here. 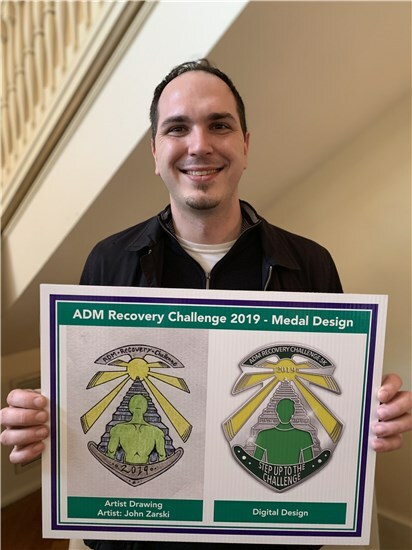 John Zarski and his winning design for the 2019 ADM Recovery Challenge 5K medal.